Herrliche Maui Oceanview: 2 Schlafzimmer / 2 Badezimmer Eigentumswohnung - wenige Schritte vom Strand! Sie finden unsere "Condo Video Tour" unter Fotos (es ist das dritte Bild, auf das Sie klicken können), das Ihnen zeigt, wie schön diese Wohnung aussieht und die Aussicht auf das Meer. Zwei Schlafzimmer, zwei Bäder, Eigentumswohnung am Meer: Wundervolle Aussichten auf das Meer werden durch Spiegel verstärkt und laden die dramatische Schönheit Hawaiis zum Wohlfühlen zu Hause ein. Diese Nichtraucherwohnung ist ideal für Familien oder zwei Paare. Menehune Shores ist eine ruhige Wohnung am Meer im Erdgeschoss in der Nähe der ruhigen Bucht von North Kihei. Ihre Terrasse bietet Blick auf den Strand, die grasbewachsenen Hänge und den Ozean sowie eine ferne Insel. Sie werden oft spektakuläres Windsurfen und fantastische, dramatische Sonnenuntergänge sehen. Buckelwale sind oft von Dezember bis April in der Wohnung zu sehen. Neben diesem exklusiven ruhigen Meerblick bietet das Gerät in jedem Zimmer Deckenventilatoren, eine komplett umgestaltete Küche und eine Waschmaschine und einen Trockner im Gerät. Menehune Shores liegt nur wenige Schritte vom Strand entfernt. Dem wunderschönen Meerblick stehen keine Straßen oder Gebäude im Weg. Der Strand ist ruhig wie die Bucht, das Wasser ist flach, herrliche Aussichten, wunderschöne Sonnenuntergänge und perfekt für Spaziergänge. Dieser Strand ist abgelegen. Sie werden nicht viele Leute sehen. Mikrowelle, Reiskocher, Queen-Size-Schlafsofa im Wohnzimmer, Deluxe Pool (gemeinsam), Shuffle Board, Mehrere BBQ Grills auf dem Dach mit 360-Grad-Blick über die ganze Insel. Sicherheitsglastür. First thing to comment on is that the directions and entrance to the condo were very easy to follow and Hope left some lights on for us which was much appreciated since we arrived late and after dark! The place was clean and spaces comfortable - our son loved that the back bedroom was made into the King bed as requested (tall teenager). Hope and her team really do a great job with hospitality and ensuring that you have what you need during the stay - arriving with light bulbs and checking in to see if all is OK. It was great to have tvs in each bedroom so that people could relax in their own space, and not everyone had to listen to the tv if they didn't want to! We loved the view from sunrise to sunset and the fact that this unit is on the ground floor was great as we started each day just walking out to the lawn to read a book or enjoy breakfast on the lanai. This would be a great place for all ages due to the ease of access. The beach chairs were much appreciated so we could sit on the lawn or walk the short way to the beach, etc. We could walk over a mile each way on the beach and after going to Maui for the past 15 years this is a new hidden gem for us with this property's location - from the street you wouldn't know how beautiful the grounds are! The fishing cove is great for kids and those who don't like the open ocean and waves, it's very contained and safe....if you're looking for boogie boarding you need to go down the beach. While the kitchen isn't really updated, and it's small, it is well kept and is well appointed with cookware and enough plates, silverware, glassware, BBQ utensils, etc - I cooked a lot and used the property BBQs which are very clean. Washer/Dryer in unit is very useful and in good condition. We were surprised that we were all very comfortable with the trade winds and fans, and never did we feel AC was needed! It ranged from 80 - 87 degrees during our stay in March. We have become new fans of Menehune Shores and look forward to the next time we visit! We appreciate this excellent review of our Oceanfront Condo. As owners who care, this is music to our ears. We have put in all new appliances and have done complete upgrades to all the furnishings and the decor. It's the beautiful ocean view that will put you in awe every time you see the beach, palms, ocean, and the distant islands. Great condo with great location! We loved everything about our stay! Pool and beaches were perfect for our 5 year old daughter. Condo was well equipped. Very much appreciated the beach towels, beach chairs, and toys. It really is steps from the beach. A perfect setting for a morning coffee! We cant wait to go back! Our Oceanfront View is wonderful. Plus we have make the furnishings so nice, upgraded and comfortable. As the owners, we are very happy to offer a great place to stay for two couples or a family of four. We met family and had a total of 3 condos in the complex and this condo was the best. We loved the ground floor for a little extra outdoor space and easy access to the beach. We felt the views out this side of the complex were much better as well. The condo was clean and well equipped. The property manager, Hope, checked in with us before we came and during our stay to make sure we had everything we needed. We did have the key break in the lock while we were there and both Hope and the owner, Michael, were very fast to respond and take care of the problem. It was a minor problem but reassuring to know that they are responsive if something is needed. If you come with a bigger group like we did, the rooftop grilling area is awesome and a great place to watch the sunset. I highly recommend this condo and would love to stay here again the next time I'm in Maui. It's all true. The actually guests who stay in our condo, absolutely love it. 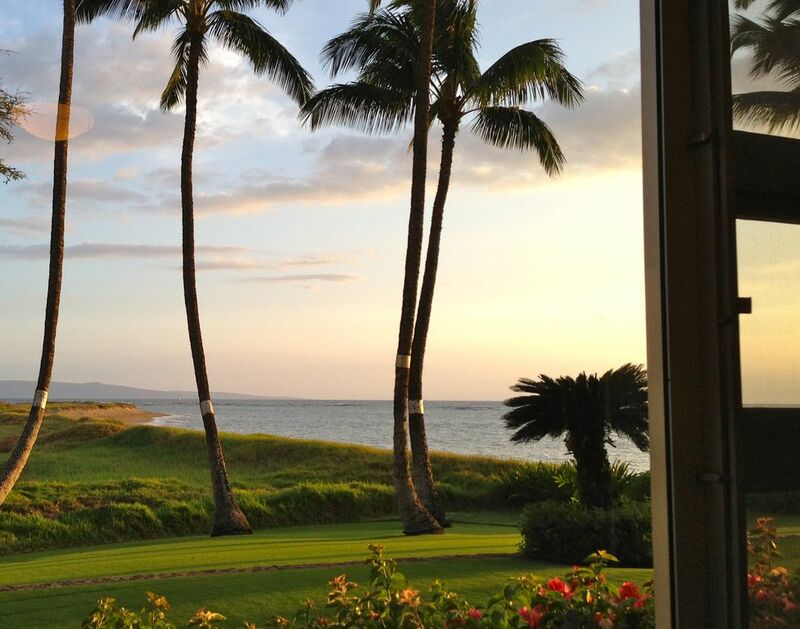 In our hearts, we want to provide a wonderful place for families or two couples to enjoy their Maui vacation with a direct ocean front view that's just steps from the beach. It's a truly a beautiful view. Best property to date that we have stayed in. Awesome walk out to the beach also extending the condo by having the front grounds as an extra room. The condo was very well equipped. Beach toys and beach chairs were an added bonus. No need to bring anything from home. The roof top bbq was very close by elevator. The weather, strong winds and rain, was not the greatest for the first two days but this condo was in the right side of the building for it not to affect us. We had five people in the condo; my elderly parents and my family of three and we found it big enough to give us all the space we needed. Thanks you for this wonderful stay. We are happy that your whole family enjoyed our ground floor Oceanfront Condo at the Menehune Shores. It's so enjoyable to have such a great 100% ocean view where the waves meet the sand, with palm trees and islands in the distance. Now that we have remolded both bathrooms with granite counters, upgraded all the furniture and have ALL new appliances like a new stove, refrigerator, dishwasher, washer/dryer, 3 flat TVs & wifi, we are proud to offer this great vacation rental to people visiting Maui. Clean great facility unit fully equiped. Great location! Access to beach was awsome! People love our Oceanfront Condo. We are so proud to offer this vacation rental. When you see the beautiful ocean view, you'll feel like you arrived in Hawaii. Spending your vacation this close to the ocean, with Islands in the distance, is very special. Great place! We will come back for another stay. Our oceanfront condo, which is just 57 steps from the beach, is a wonderful place to return to. We are happy that you want to come back. Schönsten Strände der Welt, Meer Küste, Schwimmen, feinsten Golfen, szenische Tagesausflüge wie zu den regen Wald, Schnorchelausflüge, upcountry Land, fabelhafte Windsurfen, und wunderschöne Sonnenuntergänge am Strand. Rates are subject to change, until reservations are confirmed. Three days before and after major holidays, the high season rates apply. Check-out by 11am. No late check-outs due to the cleaning for the next booking. Additional $15/night per person over 4 people.